Three years after the onset of the Clone Wars, Revenge of the Sith sees the galaxy ravaged by fighting. With Jedi dispatched all over battling the Separatist droid army, Obi-Wan Kenobi (Ewan McGregor) is assigned to exterminate their leader, General Grievous, while at the same time a now more powerful Anakin Skywalker (Hayden Christensen) becomes drawn ever closer to Chancellor Palpatine (Ian McDiarmid). Fearing the loss of his wife Padme (Natalie Portman) and their child, seen through his visions, Anakin goes to extreme lengths to prevent such an event taking place, with disastrous Sith-related consequences. Hayden Christensen is much better here. So much better, in fact. I mentioned in my review of Attack of the Clones that he comes across as stale at times, but his efforts this time around pretty much put the reasoning behind that to bed — he was simply not given good enough material to work with. In Revenge of the Sith, on the other hand, he is given vastly greater material and his depiction of an increasingly misguided Jedi and seemingly helpless husband is very good. By no means does he put in an Oscar-worthy performance (nobody does), but it is one worthy of the platform he finds himself rooted to. The ‘best performance in the film award’, without a doubt, lies with Ian McDiarmid as Chancellor Palpatine. He exudes vileness, but at the same time remains engrossing and delightful to watch as the manipulative Darth Sidious (it is not a spoiler if it is in the trailer). His calm-yet-menacing tone during scenes with Christensen actually remind me of Alan Rickman as Professor Snape in the Harry Potter films — which is a very good thing. Again, Ewan McGregor is solid here and probably puts in a trilogy-best performance, which all of the cast do to be fair. The best aspect of Revenge of the Sith, and the aspect which makes it Lucas’ best directorial performance out of his three prequels, is the character development throughout. The unravelling of Anakin into Darth Vader is the primary focus of the film and everything else fits in nicely around his capitulation. The seeds of self-doubt, originally planted in Attack of the Clones, come to fruition in a harrowing nature here and, as I mentioned before, Christensen does a fine job at portraying the evolution of one of the best and most well-known villains in cinematic history. Obviously, it is fairly straightforward to keep a character on a consistent path throughout a number of films when the films are prequels and therefore his (or her) fate is already known by both director and audience. But what I would absolutely commend Lucas on is the way in which he delivers the consistency in Anakin’s transformation — from his resultant actions after discovering his beaten mother in Attack of the Clones, to the outcome of his duel with Count Dooku and their subsequent dialogue, both Lucas by way of direction and narrative and Christensen through his delivery on-screen ensure that the birth of Darth Vader is an appropriately emphatic one. To have Anakin pulled in a number of directions here is the key to the film, and this actually makes me sympathise (and, I guess, empathise) with the character. Having visions of his wife and unborn child dying, feeling unappreciated by his master Obi-Wan and being shut down at almost every opportunity by influential Council member Mace Windu — I do not like that guy, and I am still not sure if I am meant to or not — certainly provides a substantial basis for reason to go off the rails. And that is not even taking into account his manipulation at the hands (and speech) of Palpatine/Sidious. Natalie Portman plays a necessary and potent role in generating much sympathy for Anakin, and the simultaneous sequence of the two towards the end is rightfully one bursting with emotion. Having blabbed on about the content of film itself, it would be unjust for me to ignore the sheer visual spectacle that is Revenge of the Sith. The improvement from film to film to film between the prequels is tremendous, and by the time Revenge of the Sith comes around, the magnitude of visual achievement is protruding the pinnacle of the scale (bearing in mind that the film was released in 2005, over eight years ago). The final battle scene between Anakin and Obi-Wan (in the trailer thus not a spoiler) is the most visually enticing of the entire trilogy in regards to battle sequences, and those in the CGI department deserve a huge amount of credit for their creation of a number of stunning set-pieces (at its absolute primitive, the whole saga is one massive, impressive set-piece after another). From the first scene until the last, the effects are on point and, for a film which is more or less dominated by fight scenes, I was encapsulated throughout and this is not only a testament to the stunt people, but also to the actors themselves — for the battle scene at the end, Christensen and McGregor choreographed the sequence for the most part on their own, and did not use stunt doubles at any point. Well-played. Revenge of the Sith is everything that modern cinema is all about: intelligent film-making with a clear, effective narrative, emotionally-investable characters and awesome visuals. I would even go as far as saying that Revenge of the Sith makes both The Phantom Menace and Attack of the Clones better films, whilst remaining an outstanding piece on its own. *Reading this in 2015 hurts. 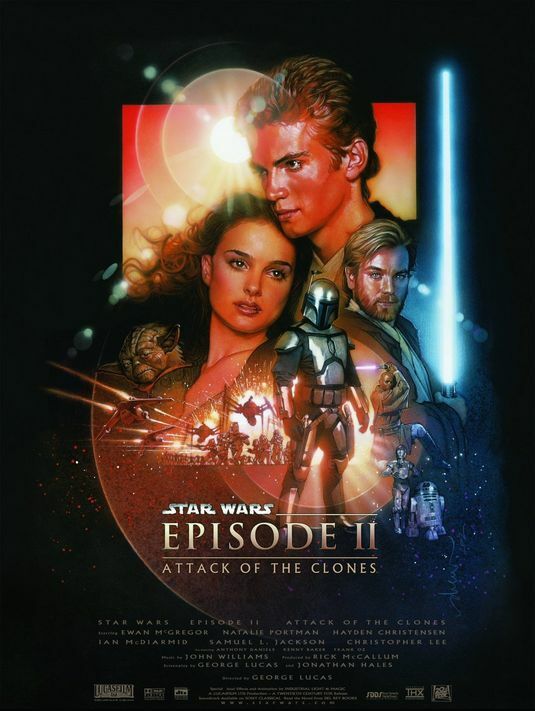 Set 10 years after the events of The Phantom Menace and in the midst of a Separatist rebellion, Attack of the Clones sees an older Obi-Wan Kenobi (Ewan McGregor) undertake a mission to discover who is behind the assassination attempt on former Queen and now Senator Padme Amidala (Natalie Portman), whilst a talented-yet-over eager Anakin Skywalker (Hayden Christensen) is tasked with protecting Padme, whom he has strong feelings for. Meanwhile, the creation of a massive clone army and a potential conspiracy at the head of the Republic both threaten the beginning of a destructive and uncontrollable war. Often regarded as an improvement on The Phantom Menace, Attack of the Clones certainly lays the foundations for a slightly more sinister Star Wars going forward — which is a good thing in my eyes. We see a number of these more sinister traits come to the forefront as the film progresses: elements of Anakin’s darker side and his ambition to “become the most powerful Jedi in the world,” the introduction of Jango Fett and his son Boba along with all that goes on surrounding them, and the themes of betrayal, conspiracy and abuse of power amongst leaders of the Rebellion. All three of the aforementioned plot-points are positives not only in terms of Attack of the Clones as a film on its own, but also in terms of the Star Wars saga going forward as they provide the basis for key narrative in the future. No jokes from me this time around, just admiration. Firstly, I do think that Hayden Christensen is a little bit hit-and-miss here. This is partly to do with the rather cliché-laden script — he is far better at the beginning of the film and towards the end, as opposed to the middle section where both he and Natalie Portman are hindered by, for lack of a better term, soppy dialogue. But his performance is also probably a result of his inexperience on the big stage — back in 2002, Attack of the Clones was only his fourth or fifth film, and his first significant one in terms of scale. Having said that, however, and having seen Christensen in other films later on in his career, I would like to think that his performance, which is a tad wooden at times, is on the whole an unfortunate product of an uninspired script. To clarify, the whole romance sub-plot between Christensen and Portman is absolutely fine, but the execution is poor and this is primarily down to the wishy-washy dialogue between the two. I like Christensen as an actor and am a big fan of Natalie Portman, but it just did not quite work this time for me. Ewan McGregor does well in carrying his half of the proceedings where the goings-on tend to be more exciting and eventful as he is involved in uncovering an assassination plot rather than a romance (just like it would be, right?). Yoda, voiced by Frank Oz, gets a bigger role this time around and, unlike Jar Jar Binks (who thankfully has a minor role here), is a necessary character who adds to the film. We also see Christopher Lee in a familiar bad-guy role, which he executes with charisma and typical bad-guy exuberance. Although the script is questionable at times, in general, I do think that Attack of the Clones has a better story than its predecessor. More things are happening this time around — exemplified by the two main characters splitting up and following different agendas for the majority of the film, unlike The Phantom Menace — and, although there is more going on, the plot is still easy enough to follow and makes sense on the whole. With neat nuances such as Anakin’s exploits when he goes back Tatooine to look for his mother and Obi-Wan Kenobi’s trip to the ocean planet of Kamino, the key events of the film have not only more meaning than those in The Phantom Menace (we did not really need to see Anakin as a child or pod-racing), but also an increased sense of direction as the eventual intersection of the varying plot-lines makes sense. Although middle films in trilogies are often looked upon as not much more than a device to further the character development outlined by their predecessor and set up events for their successor, Attack of the Clones veers just enough away from this stereotype to be a success on its own — however there is an element of my latter point in the film. Again, in tune with The Phantom Menace, Attack of the Clones is an awesome visual specimen from start until finish. It would even be fair to say that it overtakes The Phantom Menace in the looks department, which is expected considering a lot can happen in three years in regards to image and special effect technology (and evidently did happen, as Attack of the Clones was one of the very first films to be shot entirely on the high definition digital 24 frames-per-second system). Apart from the opening scene with the pod chase — which by all means looks fine, but drags on a little too long — the film moves forward at a decent pace and boasts a fair amount of enjoyable action sequences, with the Gladiator-style battle on Kamino between the Republic and the Separatists towards the end being the pick of the bunch. On that note, I do think Attack of the Clones is missing a really evil villain, and in that sense it does act as more of a buffer between the first and third films in the trilogy. Do not get me wrong, as I mentioned before, Christopher Lee does a fine job as the main villain of the piece, but he does not quite exude that total evilness and heartlessness that Darth Maul did in the previous instalment. That is all I really have to say about Attack of the Clones. 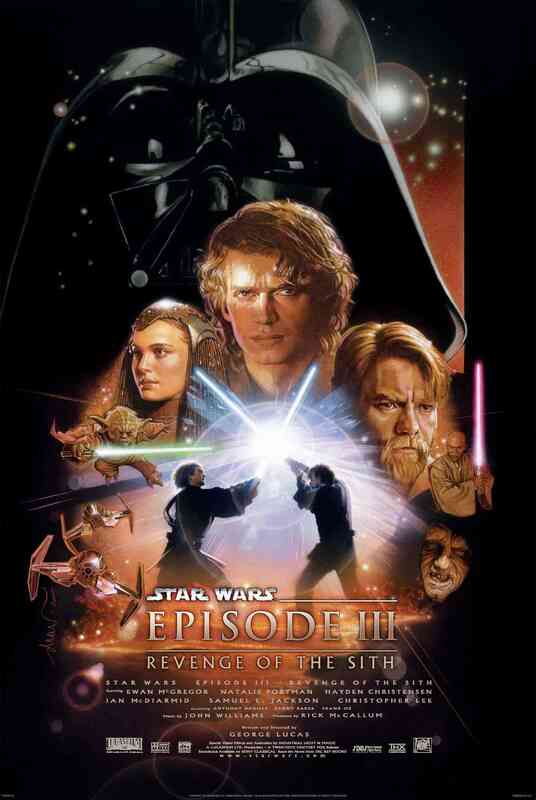 For me, this is perhaps a minor improvement on The Phantom Menace due to the overall more intriguing plot and the introduction/reinforcement of a few key characters, however the clichéd, flat dialogue between Christensen and Portman, which consumes a good proportion of the film, lets Attack of the Clones down slightly.